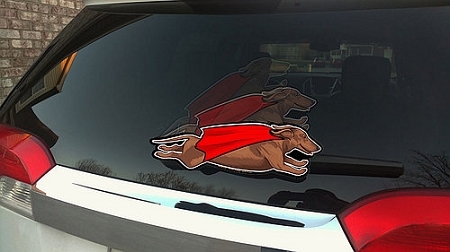 What's more entertaining that a flying wiener super dog? Universal double-sided (reversible) design fits left of right sided rear wipers. Measures approximately 12.5" x 4" MADE IN THE USA! Made from lightweight, durable, flexible, material and printed with UV protected fade resistant ink. Very easy to install using patented LOCK strips which enable them to be detached and interchangeable. WiperTags lock on tightly, and will not come off while the vehicle and wipers are in motion. They can only be removed when you're ready to detach them. Attached to the ARM of the wiper blade so it will fit any vehicle. I get so many compliments on my wiper tag! I was a little apprehensive at first wondering if it would stay in place. It fits very securely and has stayed on through rain and wiper use! Just love it! I love my wiener wiper! It works great and I definitely receive lots of looks and questions on where I bought it. Looks great on my van! This is so cute. It helps find your car in a parking lot. We just took it off when we went through the car wash and then put it back on. I love my flying wiener dog! After I put it on, I couldn't wait for it to rain. Love it, well worth the splurge. Durable, too. I love this. It is so cute on the car.